Having trouble with your walk-in cooler? Need a new one? 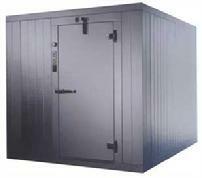 coolers, walk-in freezers, glass door display coolers and freezers, combination coolers/freezers, drive-in refrigerators and freezers, cooler/freezer panels and industrial ice machines and other refrigeration systems. We firmly believe that our customers are entitled to have their refrigeration unit repaired unless it is just not cost effective to have it done or unless the unit is really damaged. We will work with you to put the most cost-efficient plan in place, and we guarantee that all work is done on time and within budget.